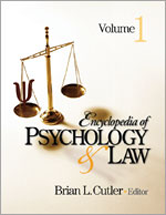 The Encyclopedia of Psychology and Law addresses the interface of psychology and law and draws from the related discipline of criminal justice. The Encyclopedia of Psychology and Law represents an outstanding collection describing a wide array of contemporary and historical psychology and law topics. This comprehensive resource is perfect to fill the substantial gap in the holdings of academic, professional, and personal libraries on this topic.